The structure of the foot is complex, consisting of bones, muscles, tendons and other soft tissues. Of the 28 bones in the foot, 19 are toe bones (phalanges) and metatarsal bones (the long bones in the midfoot). 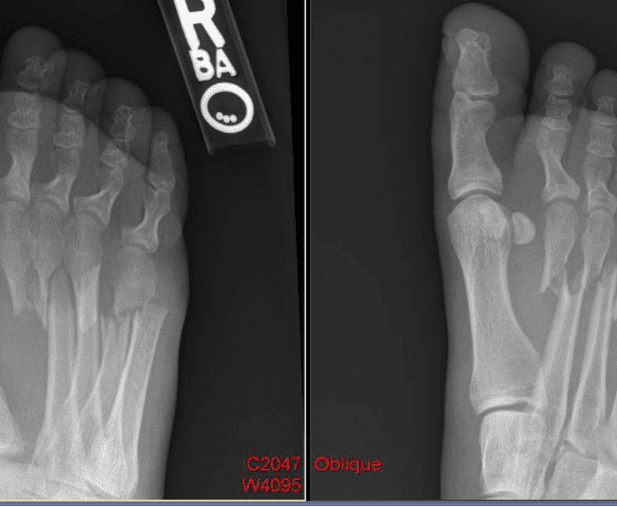 Fractures of the toe and metatarsal bones are common and require evaluation by a specialist. A foot and ankle surgeon should be seen for proper diagnosis and treatment, even if initial treatment has been received in an emergency room. Traumatic fractures (also called acute fractures) are caused by a direct blow or impact, such as seriously stubbing your toe. Traumatic fractures can bedisplaced or nondisplaced. If the fracture is displaced, the bone is broken in such a way that it has changed in position (malpositioned). Stress fractures are tiny, hairline breaks that are usually caused by repetitive stress. Stress fractures often afflict athletes who, for example, too rapidly increase their running mileage. They can also be caused by an abnormal foot structure, deformities or osteoporosis. Improper footwear may also lead to stress fractures. Stress fractures should not be ignored. They require proper medical attention to heal correctly. Rigid or stiff-soled shoe. Wearing a stiff-soled shoe protects the toe and helps keep it properly positioned. Use of a postoperative shoe or bootwalker is also helpful. Immobilization, casting, or rigid shoe. A stiff-soled shoe or other form of immobilization may be used to protect the fractured bone while it is healing. Use of a postoperative shoe or bootwalker is also helpful. Follow-up care. Your foot and ankle surgeon will provide instructions for care following surgical or nonsurgical treatment. Physical therapy, exercises and rehabilitation may be included in a schedule for return to normal activities.